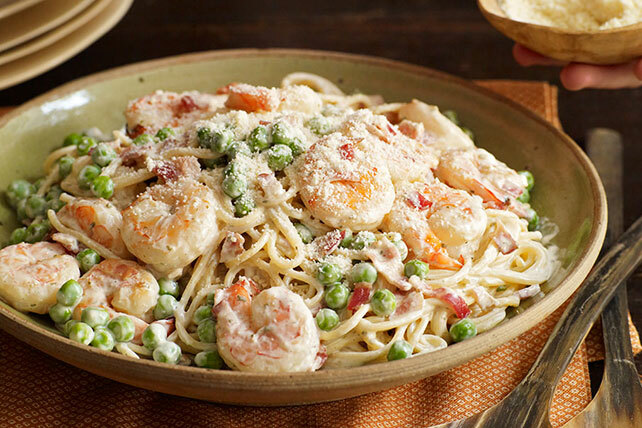 Turn your kitchen into the best Italian place in town with this Shrimp Carbonara. In 25 minutes you'll have classic Shrimp Carbonara. Buon appetito! Cook spaghetti in large saucepan as directed on package, omitting salt. Meanwhile, cook and stir bacon in large skillet until crisp. Remove bacon from skillet with slotted spoon, reserving 1 Tbsp. drippings in skillet. Drain bacon on paper towels. Mix cream cheese spread, milk and seasonings until blended. Add shrimp to reserved bacon drippings in skillet; cook and stir on medium heat 5 min. or until shrimp turn pink. Stir in peas; cook 1 min. Add cream cheese mixture; cook and stir 3 min. or until heated through. If a thinner sauce is desired, reserve 1/4 cup of the drained pasta cooking water. Add, 1 Tbsp. at a time, to finished recipe until of desired consistency. Top with Parmesan.